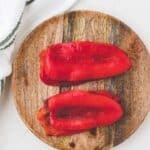 A basic guide on how to roast red peppers in the oven. You can use these roasted red peppers for many delicious recipes. Preheat the oven to 230°C/445°F. Wash the peppers, cut them in half, scratch out the seeds and cut away the stem. Place them with the cut side down on a with parchment paper lined baking sheet. Roast them for 15 minutes in the preheated oven until the skin turns black. Take them out of the oven and place immediately in a plastic bag. Leave to cool down inside the bag for 15 minutes. Remove the skin of the peppers using your hands. Use the roasted peppers right away or store them in the fridge for up to a few days. You can marinate roasted peppers with olive oil (optional: garlic, herbs, vinegar) to increase the shelf life.